If you are lucky (or unlucky?) enough to be near this humble reviewer when you watch this musical movie when it opens in theatres, you may just hear him sing his lungs out loud along with the stars in the movie. Simply because all the music on this album is so bright and cheery, one cannot help but join in the fun. The gay colors of the album cover say it all. 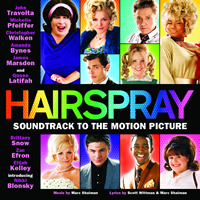 The soundtrack to the motion picture contains 19 jolly tracks performed by an all-star cast which includes the cross-dressing John Travolta (he was the original disco king in Saturday Night Fever, mind you), the catty Michelle Pfeiffer, the charming James Marsden, the powerhouse Queen Latifah (she was impressive as the gigantic Mama Morton in the movie version of Chicago, remember?) and the up-and-coming Zac Efron (watch out for the potential A-list heartthrob in Disney Channel’s High School Musical in September) amongst others. The star here is undeniably newcomer Nikki Blonsky, who plays the protagonist Tracy Turnblad in the movie. Opening the 66-minute album is Blonsky’s “Good Morning Baltimore” which injects positive energy into anyone’s dull and dreary morning. The 18-year-old actress charms you with her pleasant and enigmatic vocals, belting out her dreams and aspirations in other tunes like “I Can Hear The Bells” and “Welcome to the 60s”. Elsewhere, listen out for Travolta’s contributions in “(You’re) Timeless to Me”, a sweet duet between him and surprise surprise, veteran actor Christopher Walken. There’s also Pfeiffer’s hilariously bitchy “(The Legend of) Miss Baltimore Crabs” which will leave you chuckling at the silly lyrics penned by Scott Wittman and Marc Shaiman. There are three tracks specially written for this movie: Efron’s cheeky “Ladies Choice”, Brittany Snow’s upbeat and bimbo “The New Girl in Town” and an ensemble piece “Come So Far”. But the highlight of the soundtrack definitely has to be the big number “You Can’t Stop the Beat” merrily sung by the cast. Like how you can’t stop the catchy tune from playing your head, you can’t stop this self-indulgent reviewer from singing along with the ensemble when he watches the movie musical in the cinema.